Built 1955 by Ernst Gisel. Opened 10 Sep 1955. Complex comprising a theatre/concert hall, a restaurant, the city parliament and various function rooms. Used for theatre and musical theatre performances and concerts. 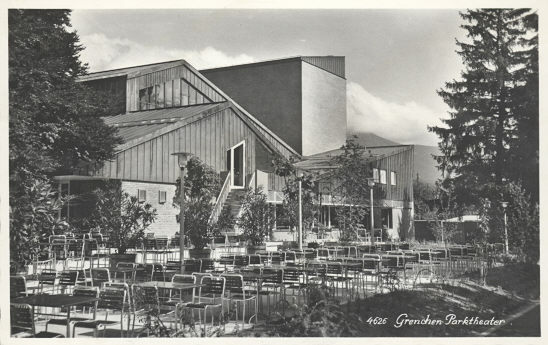 Handwritten Reverse Text: "[...] Dies ist das moderne Theater in Grenchen, innen sieht es schöner aus. [...]"